Some forty years ago, mobile services were common across Europe. In my home village, Kieldrecht, in northern Belgium, I remember how a dairy farmer had his regular clients to whom he delivered bottles of fresh milk. The service was pretty sophisticated. Varied numbers and sizes of bottles were delivered on people’s doorsteps on different days of the week, depending on what the clients wanted. Once a month people paid their bill. They would pay cash (after a short, friendly chat), or if they were away at work, they would leave the coins in an enveloppe on the doorstep for the milk man to collect. A quality, tailor-made service it was. Early mornings, two competing bakers delivered bread to their customers. My granddad, who lived by himself on his family farm, was happy to pay a few cents more for his bread, while receiving some friendly words or a joke from the baker’s son. But society has changed and most of those village services are long gone. Supermarkets and bread machines at the corner of streets have replaced the personalised services. Services have become more expensive and today’s customers no longer want to devote as much time to producing and processing food as our parents’ and grandparents’ generations did. But with an increased consciousness of healthy food and a desire from consumers to reconnect with food producers, some old services such as home deliveries have come back, while new initiatives such as farm shops and subscriptions to weekly vegetable boxes have become increasingly popular. 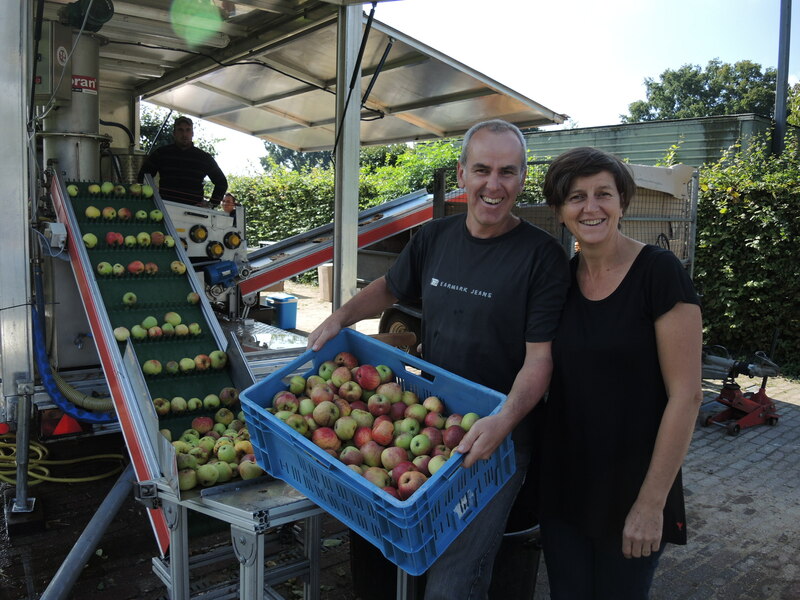 Last week I experienced a delightful local initiative to save some of our food and farming heritage in Limburg, the northeastern province of Belgium. Limburg is known for its bicycle culture, greenery and orchards, all of which contribute to local tourism and the local economy. Unfortunately, family orchards have suffered from the same lack of time mentality of our generation; many orchards with tall, old varieties have been abandonned with few new ones being planted. 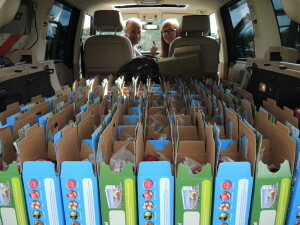 To maintain the genetic diversity of old fruit varieties the National Orchard Foundation established a genebank with over 3,000 old and valuable local fruit varieites. Besides their own orchards that serve as research, demonstration and training sites, the foundation has also successfully convinced people like my late father-in-law to plant local fruit varieties. Over the past thirty years hundreds of people across the province and country have gradually re-established fruit gardens with old varieties. Until 2014, one could even get subsidies for planting tall fruit varieties. “But how to keep y oung families motivated to plant and maintain fruit trees? Money to buy trees isn’t the bottleneck, but time to maintain an orchard and process the fruit are. As fruit spoils fairly quickly, why would one bother to pick a few hundred kilograms of fruit?” my wife, Marcella, asked herself. Until she learned about the “Juice Mobile”. 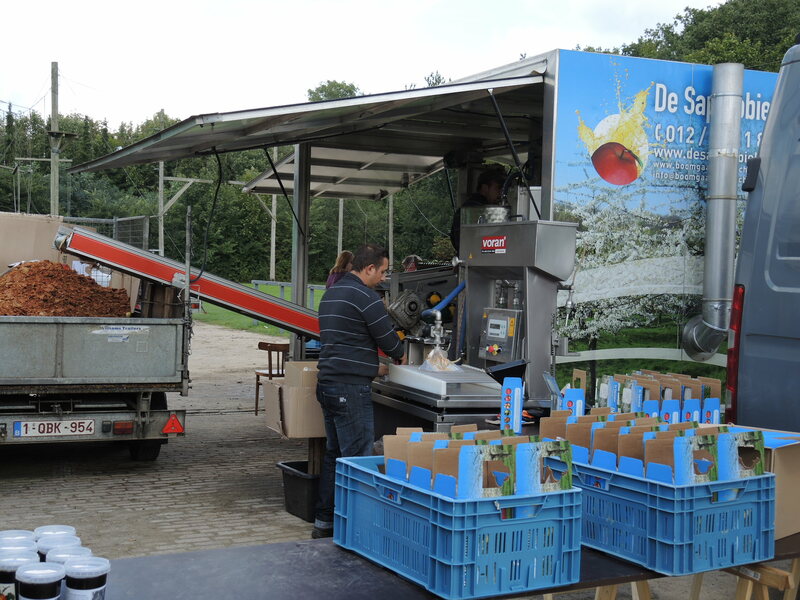 On specific days throughout the fruit harvesting season (September to early November) the juice mobile comes to certain locations to process small batches of fruit from family orchards into fresh fruit juice. The juice mobile is operated by the National Orchard Foundation in collaboration with its sister organisation NBSW (Natuur en Boomgaarden Sociale Werkplaats). During the harvesting season, the crew of three people works long days. On a single day, they press up to 5 tons of apples, pasteurise them, and package it all in 3-liter or 5-liter sterile bags, neatly placed into cardboard boxes. 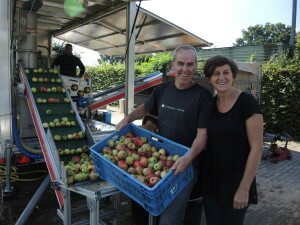 The orchard owners go back home with all the juice from their fruit, and pay 1.25 Euro per liter for the entire service. So we called upon Marcella’s sisters, brother, nephews and nieces. One day we picked some 600 kilograms of apples, and the next day brought them to the juice mobile. In an hour and a half we had over 400 liters of fresh juice. 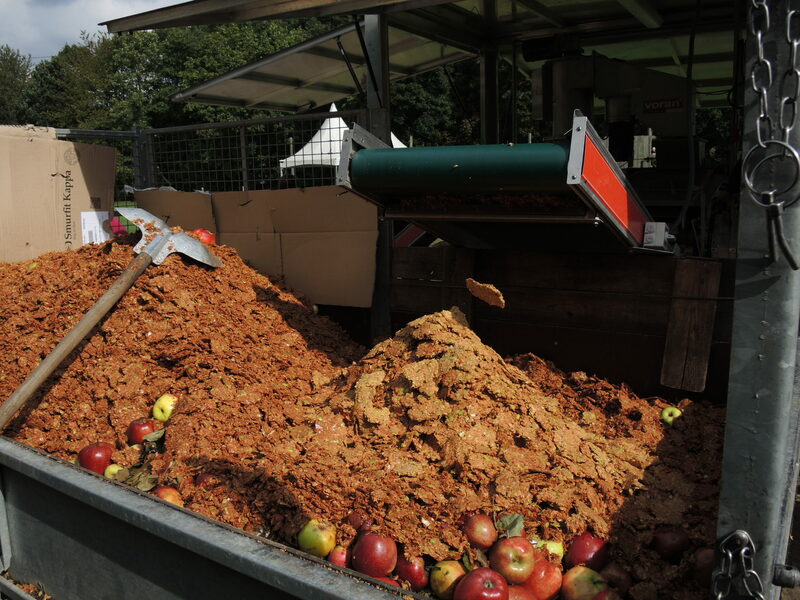 The dry fruit pulp along with the rotten and overripe apples that are sorted out at the beginning of the conveyer belt are taken to a nearby farm to turn into biogas. They were two rewarding days: being out in the fresh air, picking the family’s fruit trees, chatting with other people from the community. For a full year, the entire family will fondly recall that Marcella’s dad planted those old apple varieties. Family ties and conservation of old fruit varieties can strengthen each other, with a little help from modern agro-processing.